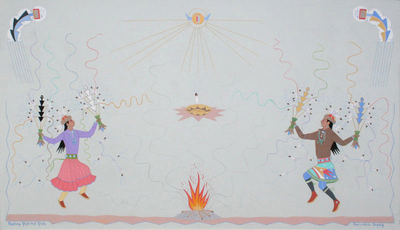 Harrison Begay, Fire Dance, Gouache on board, c. early 1990, 18" x 30"
Harrison Begay or Haskay Yahne Yah (Warrior Who Walked Up to His Enemy) was born in White Cone, Arizona on the Navajo Reservation in 1917 or sometime around then. He's never been sure about the date. His parents were Black Rock and Zonnie Tachinie Begay. His mother died when hewas seven, and soon after he was sent off to government boarding school at Fort Wingate where he heard English spoken for the first time. After a year he ran away from school to return home where he studied by himself and herded sheep. At seventeen he entered the recently founded Santa Fe Indian School and studied art under Dorothy Dunn. Until the school was founded, Navajo artists had no tribal tradition of painting, so what Harrison learned was later considered "studio style". Students were taught to place smoothly brushed forms flat on the picture plane. In 1936 Begay painted Navajo Horse Race at the school and sold the piece to Charles Mc C. Reeve for twelve dollars. It is now in the Southwest Museum connection in Los Angeles. 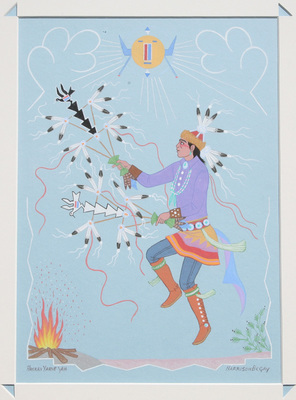 Harrison Begay, Native Dancer #1, Gouache, 1980, 13" x 10"
When he graduated from Santa Fe Indian School as salutatorian in 1939, Harrison went on to study architecture at Black Mountain College in North Carolina on a scholarship from the Indian Commission. He also created murals for the WPA during the Depression before spending three years in the Army during World War II. He served under General Dwight Eisenhower and also participated in the Battle of Normandy. 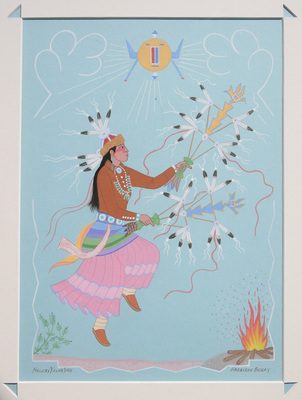 Harrison Begay, Native Dancer #2, Gouache, 1980, 13" x 10"
When he was released from the Army, Harrison spent a brief time in Colorado studying with Gerald Curtis Delano. He received a purchase award at the first Indian Annual Painting Competition at the Philbrook Museum of Art in Tulsa, Oklahoma. Upon returning home to Arizona in 1947 he resumed his painting career in earnest and eventually became one of the most famous of all Navajo painters. 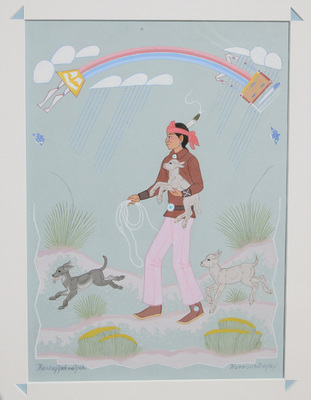 He created Tewa Enterprises during the 1950s in Santa Fe to make and sell reproductions of his and others artwork. 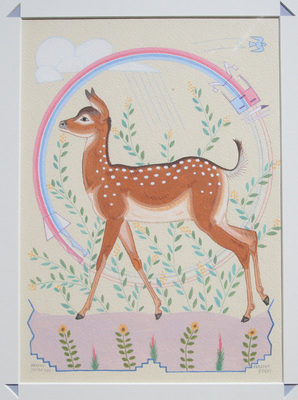 Collectors enjoyed his subtle watercolors and silkscreened prints. Since he spent somuch time off the reservation growing up, he learned much later about traditional Navajo ceremonies from a book by artist Don Perceval. This deepened understanding of his own heritage greatly influenced Begay's work from that time on. 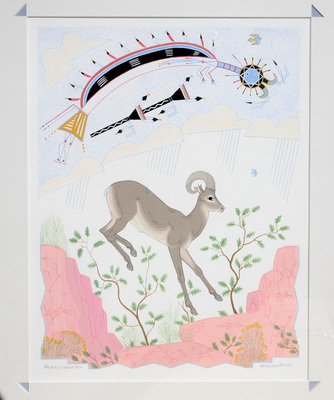 Harrison Begay, Rainbow God, Gouache, 1980, 13" x 10"
Still painting in his 90s, Begay was awarded the 2003 Lifetime Achievement Award by the Southwestern Association of Indian Artists, organizers of the annual Santa Fe Indian Art Market. His portrait was featured in the Smithsonian Institute's Museum of the American Indian in 2004. Harrison Begay, Talking God, Gouache, 1980, 13" x 10"
8. Peggy and Harold Samuels, "Encyclopedia of Artists of the American West"
9. Patrick Lester, "The Biographical Directory of Native American Painters"